A power procedures table is a wise investment for your practice. There are many challenges facing you and your practice today, so choosing the right equipment is more important than ever. More and more healthcare providers are investing in power tables when updating or constructing new facilities. This new trend is making exam and procedure rooms more efficient and safe, allowing a better overall healthcare experience for the patient. Make the smart choice by choosing the Ritter 230 Power Procedures Table and experience the many benefits of a power table. As the practice of medicine changes, more procedures are being performed in the office than ever before, making efficiency essential. Positioning patients can be a difficult task when dealing with less mobile, elderly and special needs patients. The Ritter 230, with its low height and multi-positioning capabilities, improves office efficiency by allowing you and your staff to easily position patients with the touch of a button; reducing the likelihood of fatigue, back and neck strain and workplace injury. Patients will feel more comfortable and secure when they can easily get onto a table and experience smooth and steady movement during positioning. Their anxiety will be reduced, and they will feel satisfied with the level of healthcare you provide. 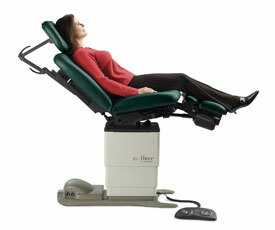 Consider the Ritter 230 Power Procedures Table a long-term investment for your practice, your staff and your patients! The Ritter 230 Power Procedures Table with power height, back, foot and tilt allows you to effortlessly and precisely position patients for a multitude of procedures. Optional hospital grade outlets (on each side) allow easy access to electrical power providing a clean look to the room and floor space free of power cords. Ergonomic and intuitive standard hand control in easy-to-find location. The Ritter 230 is a power procedures table with basic features, making it very affordable. Better yet, the Ritter brand has been providing quality products to healthcare professionals for over 50 years and is recognized as an industry leader. 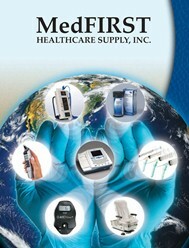 Optional foot control accessory maintains sterile field and can be used in combination with hand control. Select your style...traditional linear style or more efficient disc style. Extending the stirrups and treatment pan, lowering the foot support and tilting the seat provide the perfect position for OB/GYN exams and procedures. The table supports exams and procedures requiring supine, prone, left lateral or right lateral positioning. Tool-less reconfigure of the foot support provides the perfect position for colon and rectal exams and procedures. Whether better positioning the patient, treating for shock or faintness or increasing anesthesia onset, the Trendelenburg position offers a full 30° of tilt. With the increasing number of elderly and disabled patients, the low entry position makes it easy and safe for the patient to get on and off the table. Exam and procedure rooms are being equipped with more and larger devices. Inefficiency results when moving these devices to the patient. Outfitting your procedures table with the rotation option simplifies this task by allowing you to move the patient instead of the device. The simple touch of a pedal on either side of table permits 350 degrees of rotation; touch the pedal again to lock table in place. It's that easy!